Pokémon Go is easy enough for anyone to pick up, but if you want to catch 'em all, you'll need to master the art of throwing Poké Balls. For the most part, catching a Pokémon in the game is as simple as throwing a Poké Ball straight up at the monster and hoping it doesn't escape. You can also throw a curve ball at Pokémon, but that's a more advanced technique. To get the perfect straight throw every time, My Mini Factory user Jon Cleaver has created this clever Poké Ball "aimer" case for iPhone. With the case slipped over an iPhone, players can swipe perfectly straight up whenever they encounter a Pokémon. 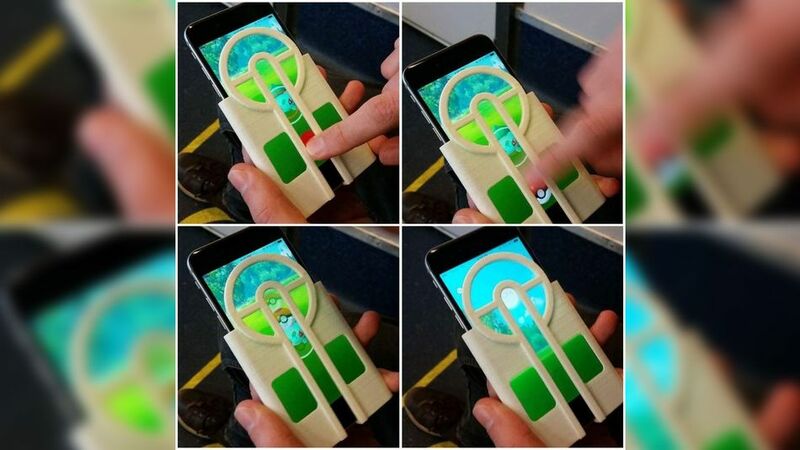 "This 3D printable Pokeball aimer ensures your finger never goes astray," says Cleaver. "Simply slip your iPhone into the case, give it a flick, and you’ll be catching Pokemon with ease." Sure, you'll only be cheating yourself. And deep down in your heart you'll know you used a 3D-printed accessory to help you. But who's gonna know when you show all your friends your near complete Pokémon collection? If you own or have access to a 3D printer, you can print your own Pokémon "aimer" case using the free model. The case only fits iPhone 6 and 6S devices, but if there's enough demand (and we bet there will be), Cleaver says he'll consider making versions for other phones. Another fan 3D-printed a Pokédex. It looks cool and has a built-in battery pack, but it won't increase your success of catching Pokémon as with Cleaver's case.